Can anyone help us identify a shrub, which we have growing in the garden here? It seems to be relatively common here in West Sussex. Our daughter has a very tall specimen growing in her garden and earlier in the year it seemed to have small flowers that were almost black in colour. Our example is about six feet tall and about 3 feet wide. 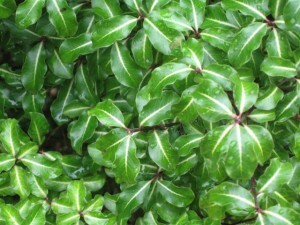 The photo below shows the rather interesting glossy striped leaves. We’d be grateful for any suggestions as to what this tree might be. This entry was posted on Saturday, August 21st, 2010 at 4:15 pm and is filed under Diary & News. You can follow any responses to this entry through the RSS 2.0 feed. Both comments and pings are currently closed. Hi Jenny might be a Pittasprrum – I had in London in a very sheltered spot -it is very pretty.Not dye plant as afar as I know. I have just got my new copy of Wild Colour as my original copy got badly damaged. I am so glad it is back in print. definitely a Pittosporum. they’re native to New Zealand and enjoy a cool climate. Just to add to the general consensus…..it is a Pittosporum. Generally hardy in the south. Flower arrangers use the foliage as ‘filler’ but I don’t think it is a dye plant. I’ve definitely dyed with this many times. Use alum + CoT – 20 yrs ago used copper. It was one of the plants that I used when I had a dyeing session with my nieces, nephew, brother and sister. We used what was about to be educational. My mother then knitted the children hats!